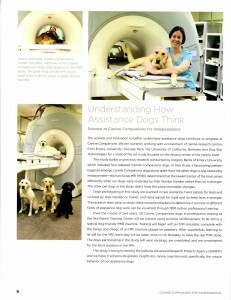 Research conducted by Dog Star Technologies, a canine neuroscience company co-founded by CPT’s Mark Spivak, was featured in the Spring 2015 issue of the Canine Companions for Independence (CCI) magazine, “The Companion.” The article, entitled “Understanding How Assistance Dogs Think- Science at Canine Companions for Independence,” discusses bi-coastal research funded by the Defense Advanced Research Projects Agency (DARPA) and conducted by Dog Star Technologies and Dog Star’s subcontractors Emory University, Georgia Tech University’s entrepreneurial research arm- the Georgia Tech Research Corporation (GTRC), and the University of California, Berkeley. The project entails a two-year seven figure Small Business Technology Transfer (STTR) contract awarded to Dog Star, whereby Dog Star designs the research and then operates the research in collaboration with the listed university subcontractors. The research is based upon a prior study completed for the Office of Naval Research (ONR) by CPT’s Mark Spivak, Emory Professor Gregory Berns, and Emory Postdoc Andrew Brooks published in PLOS One and covered nationally and internationally in the media, including the BBC and PBS series Nova and the CBS news documentary 60 Minutes. Mark and Greg co-founded Dog Star and work on the project. Mark is Dog Star’s Chief Operating Officer, Greg is Dog Star’s Chief Scientist, and Andrew is Dog Star’s Project Scientist. Emory University provides local support services. 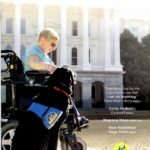 The Georgia Tech Research Corporation is developing mobile and stationary pneumatic and motion sensor products that in conjunction with Dog Star’s fMRI protocols are aiming to achieve the project’s objective of creating a scientific protocol for better identifying optimal service dog candidates. The University of California, Berkeley provides west coast MRI services within their Li Ka Shing Center for Biomedical and Health Sciences. A PDF of the article in “The Companion.” You can also read the entire issue of the magazine by clicking the link in the first paragraph. Each quarter the Dog Star team and their Georgia Tech colleagues travel to CCI’s Santa Rosa, CA headquarters to test a cohort of dogs on the mobile and stationary sensors. They then travel to Berkeley to test the dogs in Berkeley’s 3T Siemens MRI. After testing a total of 50 dogs, Dog Star will author a report to DARPA and then commercialize relevant findings and products that emanate from the research. For more information about Dog Star Technologies, please review the Dog Star website. For more information on the team’s research, please review the CPT News and CPT Tails section of the CPT website and the CPT Facebook Page.